Below you will find answers to some of the more common questions that we receive in regards to our PVC vent screens. If you have specific questions about our products, which have not been answered on our website, please contact us. What do your PVC vent screens do? Our vent screens are designed to act as a breathable barrier between your high efficiency furnace, power vent hot water heater or boiler’s venting system and the outdoors. By utilizing our vent screens, rodents, insects and debris will have an extremely difficult time finding their way into your home. What are PVS series vent screens? PVS is an abbreviation for Professional Vent Screen. Each PVS series vent screen is designed to maximize airflow, making them the safest and most compatible vent protection solution available. 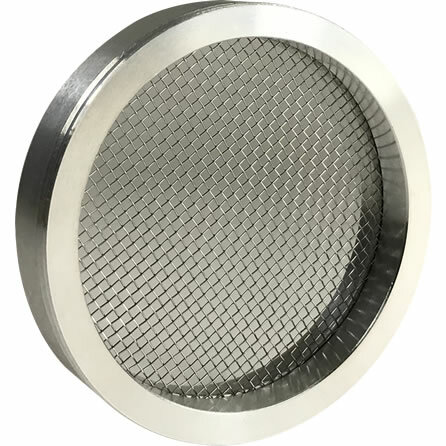 Additionally, PVS series vent screens meet and exceed many high efficiency appliance manufacturer requirements and are designed to provide many years of trouble-free service. Our professional grade vent screens are routinely used by HVAC, plumbing and pest control companies. However, many others use our vent screens as well that include a variety of municipal, county/parish, state and federal government agencies. We also provide protective venting solutions for residential and commercial builders that demand the best vent protection for the homes and commercial buildings that they build. What size screen should I use with my vent(s)? Please visit our size help page for detailed instructions to measure your existing vent termination(s) for proper vent screen fitment. We regularly ship to customers residing in the United States and Canada. The country selection dropdown box is found on our checkout page and must be selected to place an order. For our Canadian customers, we recommend selecting First Class International Mail for the most affordable shipping option. Customers residing in the United States receive discounted Priority Mail rates (lower than retail pricing) and we recommend this expedited shipping service since we have passed our volume discounts on to our valued customers. Do I really need a PVC vent screen for my hot water heater? Yes. Although power vent hot water heaters cycle throughout the day to keep water warm, unwanted animals, insects and debris can still enter an unprotected PVC exhaust pipe. During the winter, when insect activity outdoors is not occurring, small animals (chipmunks, squirrels, mice, moles, etc.) may find the warm air being discharged from a hot water heater’s exhaust more comfortable than frigid outdoor temperatures. Furthermore, power vent hot water heaters that have an intake and exhaust should have both vents protected. Please keep in mind that the temperature inside the PVC pipes of your high efficiency appliance will always be an invitation to small rodents seeking shelter from the cold. Does my furnace need vent screens? Yes. Any unprotected opening that leads from your high efficiency furnace to the outside of your home is asking for trouble. Small animals and insects (bees, wasps, etc.) can find their way right into your home and even nest within the furnace itself. Especially during the summer, when furnaces are not operated, an insect vent screen should always be used for optimal protection. My furnace has an intake and exhaust vent. Which vent(s) should I use a screen in? Though different furnaces will have slightly different designs, the exhaust vent connects to the inducer motor and the intake vent connects to the burner compartment. Both entryways (intake and exhaust vents) into your furnace and home should be protected throughout the year. Though insects can be troublesome and lead to costly exterminator and furnace repair bills, the damage from animals trapped inside a furnace may be even more costly. For example, one of our customers was dispatched on a residential repair call that had a dead squirrel inside their furnace. Before the squirrel died, from apparent electrocution, it damaged many sensors, the control board and other costly components within the furnace. The damage was so severe that it was more cost effective to replace the entire furnace. The HVAC technician, which is our customer, installed two 3″ rodent screens from our PVS-IRS3-2 kit in the exterior vents for the replacement furnace and showed the homeowner how easy it was to switch them to the 3″ insect screens in spring for year-round protection. My high efficiency furnace, hot water heater or boiler came with a vent screen. Should I still use yours? This is a difficult question to answer as there are many manufacturer supplied vent screens on the market. Oddly enough, some high efficiency appliance manufacturers do not supply protective screens to safeguard their customers. Regardless, a rodent vent screen will do little to keep bees, wasps and other insects from nesting inside the appliance’s intake or discharge pipes during months where insect activity outdoors is common. At a minimum, a rodent vent screen is often recommended by most HVAC and pest control professionals. My high efficiency appliance already has a vent screen in it. Do I need to remove it to use your vent screen? You should never operate high efficiency appliances with two screens occupying the same vent. With that being said, there are circumstances where it is acceptable to install our insect PVC vent screen over a previously installed rodent vent screen. For example, some high efficiency furnaces have wide mesh or plastic rodent vent screens installed on their intake and exhaust vents. Since rodent vent screens do not prevent insects from entering the vents, some of our customers install our insect vent screen over their existing rodent screen during the summer (when the furnace is not in use and insect activity is at its highest). Are your vent screens easy to install? Absolutely. Each vent screen we sell includes one stainless steel clip. The clip fits inside the horizontal intake and exhaust pipes to securely hold the vent screen in place and is hidden from plain view. In other words, our vent screens are not eyesores and do not detract from the exterior of your home. Our vent screens are installed in horizontal PVC intake and discharge pipes in as little as thirty seconds and can be removed just as easily. View our easy installation instructions here. Will your vent screens work with my appliance? Although we have tested our vent screens on a variety of furnaces and hot water heaters without any issues, there is no way we can determine the requirements of your high efficiency appliance(s). However, we do provide some general vent screen guidelines that will help you determine which product is best suited for your needs. It is important to note that the length of your intake and exhaust vents does impact performance. For example, extremely long runs of vent pipe may require a very wide and open mesh. We have successfully tested shorter runs of pipe (approximately 30’) with not one but two vent screens in the same vent. Regardless of our tests, if you have any questions regarding your high efficiency furnace, hot water heater or boiler then we recommend you contact the manufacturer for assistance. Are PVC vent screens better than plastic guards or caps? The short answer to this question is yes. Guards are often designed for vertical PVC pipe vents and not those used with appliances that are horizontally vented. Caps should never be used on any high efficiency appliance. You can learn about the differences of screens, guards and caps on this page and also view our cautionary warning. Also, it is very important to note that many plastic guards and caps are highly restrictive and may cause an unwanted and potentially fatal buildup of carbon monoxide to occur in the dwelling. Will ice form on my vent screen during winter? Our PVS-RS series wide mesh vent screen is designed for use on intake and condensing exhaust vents during any season, including winter. However, icing problems normally indicate a serious issue with the PVC pipes inside a home and overall installation. In such cases, improperly installed PVC pipes may produce ice with or without a vent screen in use. 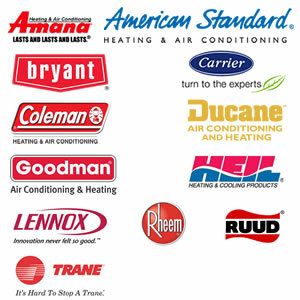 It is best to contact a qualified HVAC company to send a technician out to view your installation. Do you sell vent screens in different sizes? 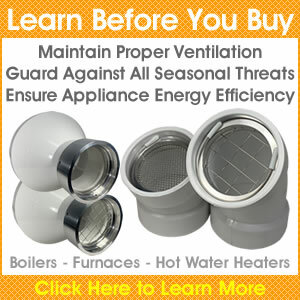 All of the vent screens we sell can be found in our store. However, we are continually improving upon our products and do plan to manufacture a variety of vent screen sizes in the future to accommodate PVC pipes of different diameters. Please visit our company news page to learn more about planned product launches and other important events occurring within our company. Do you offer any discounts for your products? 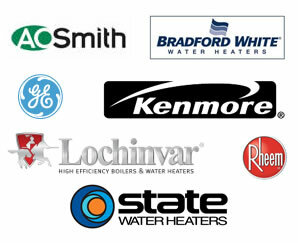 Yes, we do offer discounts to some professional HVAC, plumbing and pest control companies. We encourage these professionals to contact us to learn more about our volume pricing plan. Occasionally, we also offer seasonal coupon codes that anyone can benefit from. Is there anything I can do to prevent insects and animals from entering my high efficiency appliance’s vents in addition to using screens? Yes. Both insects and animals are drawn to sources of water and food. It is a good idea to not store garbage cans near horizontal intake and exhaust vents and to locate bird feeders far enough away from the home so that animals are not attracted to the vent pipes. The same applies to grills as they do tend to have grease traps that animals and insects (especially yellow jackets) find appealing. Flowers also attract pollinating bees, and it is best to design your landscape in such a way that does not encourage bees to come near your intake and exhaust vents. Ponding water near intake and exhaust vents will also allow insects to breed and can be a source of water for outdoor animals looking to quench their thirst. Issues involving ponding water should be corrected and bird baths should be located elsewhere within the landscape. Another common problem witnessed near high efficiency appliance venting systems is how items are stored outside. Lawn chairs, patio storage chests and other outdoor comfort items may allow animals to use them as ladders to reach high efficiency appliance vents that are located higher above the ground. To reduce the likelihood of an animal getting near your vents, please relocate outdoor items that animals could potentially climb to get into the PVC hub elbow vents. What should I do if I have insects or animals in my high efficiency appliance’s venting system? If you suspect insects or animals have made an unprotected high efficiency vent pipe or appliance their home, the first thing you should do is turn off the appliance and the circuit breaker that feeds electricity to it. Next, you should call a professional to evaluate the problem. If your hot water heater vents are obstructed, call a plumber. You would need to call a HVAC professional if your furnace is giving you trouble. In many cases a plumber or HVAC professional will seek the additional services of a pest control specialist for those situations involving live animals and insects (yellow jacket colony, active beehive, etc. ), which are potentially dangerous situations. Once the insect or animal problem has been remedied, the appliance may be fully inspected and repaired. Often sections of PVC pipe are replaced as well since they may contain dead insects, animal feces or other organic substances that can get drawn into high efficiency appliances. Please note that if insects or an animal is not contained within the PVC pipe or appliance, and has entered the main living space of your home, it is best to vacate the home and call a pest control specialist immediately. Colonies of bees and scared animals that are loose inside a home pose a serious danger to all occupants.